Jaipur : The Indian Army has decided to observe 2018 as 'Year Of The Disabled Soldier' to honour its soldiers who have been disabled while serving the nation. The primary focus is to alleviate the suffering of these individuals who have done their share of duty for the Motherland and in the bargain have been maimed for life. The Army's 'Sapta Shakti command' south western command at Jaipur, today unveiled a programme to commemorate the 'Year Of The Disabled Soldier'. 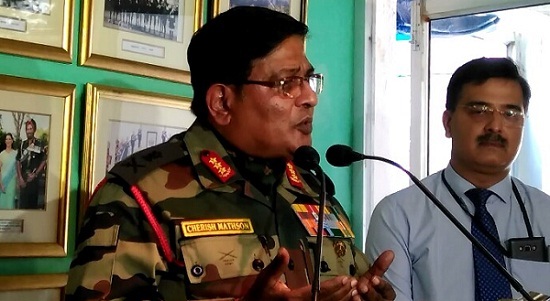 At Indian Army's Sapta Shakti Command here today, the Lt. Gen. Cherish Mathson told that, This year Army would specifically concentrate on their rehabilitation and welfare. The programme to be conducted in Rajasthan and other areas for commemoration of disabled soldiers with the theme 'Disabled Soldiers - Legacy of Service and Life of Dignity'. The disabled soldiers are requested to contact their nearest Zilla Sainik Welfare Office to register their names and contact.